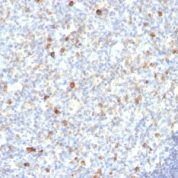 Recognizes a protein of 75kDa, identified as mu heavy chain of human immunoglobulins. 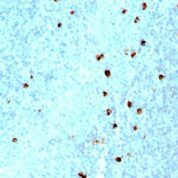 It does not cross-react with alpha (IgA), gamma (IgG), epsilon (IgE), or delta (IgD), heavy chains, T-cells, monocytes, granulocytes, or erythrocytes. Monomeric IgM is expressed as a membrane bound antibody on the surface of B cells, as a pentamer when secreted by plasma cells. 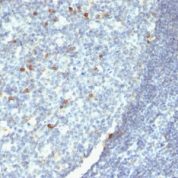 IgM antibody is prominent in early immune responses to most antigens. Aberrant levels are associated with immune deficiency states, hereditary deficiencies, myeloma, Waldenstrom's macroglobulinemia, chronic infection, hepatocellular disease. 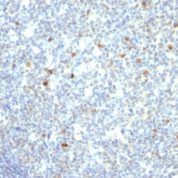 This MAb is useful in the identification of leukemias, plasmacytomas,, certain non-Hodgkins lymphomas. The most common feature of these malignancies is the restricted expression of a single heavy chain class. 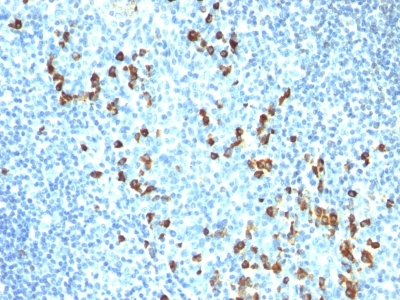 Demonstration of clonality in lymphoid infiltrates indicates that the infiltrate is clonal, therefore malignant.